It was 2 years ago. Thanksgiving was fast approaching and after all the feasting and pounds gained, the days following would be filled with lots of shopping and gift wrapping. Or at least, that’s how it was in the past. When, normally, my husband and I would have a budget set for Christmas gifts, this particular year, we had nothing. My husband had been out of work for a few months, and we had been rapidly depleting our emergency savings. We were prepared to let our families know that we wouldn’t participate in any gifts exchanges that year. We knew they would understand. Then, it occurred to me. We had money, “hidden” in store loyalty rewards and forgotten gift cards. Much of our reward dollars were from drugstores and office supply stores. Not your typically Black Friday destinations, but we definitely avoided the crowds by shopping at these places. We actually found some nice gifts at these stores. Typically on Black Friday, the stores with customer loyalty programs mark even more items that generate reward dollars or gift cards. By focusing on these items, we essentially got them for free … paying for them with our rewards and walking out with more rewards to use for the next trip. Before my husband left his job, he often met with clients outside the office, and his employer reimbursed him for all his expenses: meals, mileage, etc. We rarely use a credit card, but to keep his business expenses separate from our personal ones, my husband used our credit card whenever he was working. By the time holiday shopping season came around, we realized that all those credit card charges accumulated a nice amount of cash-back for us. Don’t you get excited when you empty pockets before doing the laundry, and you find a $10 bill all crumpled up next to the pocket lint? That’s how I felt when I realized there were gift cards in my purse from I-don’t-know-how-long ago. Being forgetful did pay off that time! Though this is the busiest shopping season of the year, I know not everyone can afford to buy presents for Christmas. With no income coming in, we certainly thought we couldn’t. But after digging a little deeper, we realized we still had some resources to be able to give to our loved ones, even during such a lean financial time. And of course, not every gift can be bought from a store. Sometimes, those made with love are the best kind. 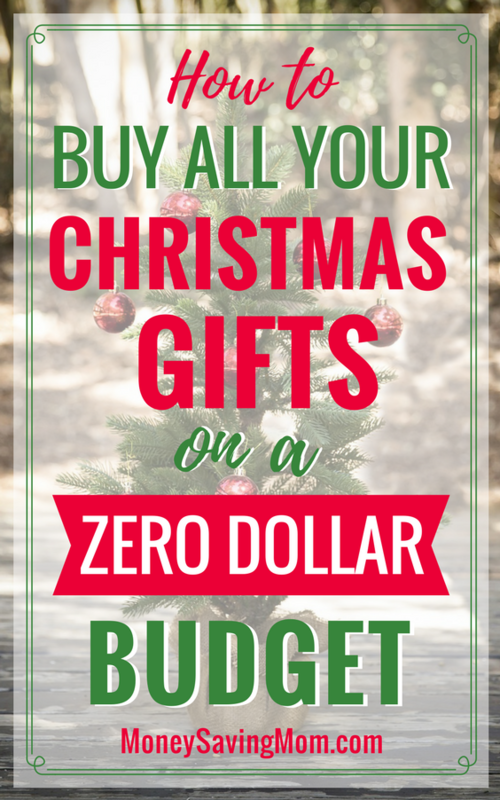 What are some of your frugal gift ideas? Ai is a follower of Christ, a wife, and a homeschooling mother of 4. She loves to spend time with her family, savoring every moment that she has with them. One great lesson in life is that everything is a gift, whether money or time or food or shelter or relationships. She blogs about making the most of the gifts that we have at . We were able to pull off a $0 budget for Christmas this year. I saved all my Amazon gift cards from Swagbucks and Bing rewards ALL YEAR. Was able to get a nice gift for my hubby, a few small toys for our toddler son, and hubby used them to get something for me, too. My dad found an entire set of Duplo blocks in the junk (yes I sterilized them) that we also plan on giving him. And a friend had a play tent that they lo longer wanted. I hear a lot of people getting some good stuff through Swagbucks & Bing. That’s something I want to do more of. I like Bing Rewards more than Swagbucks because it’s more certain and takes less time. You’re allowed a max of 15 points per day for PC searches (unless they’re doing a double point day. Then it’s 30.) whatever points they give you in your inbox, and a max of 10 points per day for mobile searches. Thing about the PC searches is, on the Bing home page, there’s a bunch of news articles. I just hold down the CTRL key and click on each news story to open it in a new tab. Opening those news stories counts as a search. Then I just close them all again (unless there’s one I want to read, of course). There’s usually enough articles to max out my points for the day, so literally, I’ve maxed out my PC searches in less than 5 minutes. Once you’ve achieved gold status (which isn’t that hard to do) you get a discount on the rewards, so even without doing the mobile searches, I usually get a $5 Amazon giftcard every month. No surveys to take. No special offers to complete. It’s a lot simpler. But I do still use both, anyway. Even though Bing is easier, Swagbucks is going to give you a bigger payout for your time. I generally spend anywhere from a half hour to an hour and a half and earn $30-50 a month. I recently earned $100 from October 15- Dec 15th to cover Christmas presents for my niece and nephews and even have $11.00 to still cash out. I recommend using the page in the beginning it helps that over time you learn to weed out what does and doesn’t pay out. I also suggest setting your own goals instead of focusing so much on theirs. In the beginning I’d set a daily goal of 72 with the thought of earning $5 a week(you could set it to a lower 65 for a $5 amazon). As I got better I’d try a little harder for their goals to get the bonus. With Bing you pretty much earn $5 a month, with swagbucks you can somewhat easily earn 5x that once you figure out what your doing. Between the 2 that’s an extra $360 for Christmas. Yeah. I don’t often have that much time to devote to it. The 5 minutes in the morning I spend doing Bing is about all I can handle, right now. I’m a working mom with an out-side the home job. By the time I get home, feed the kid, and clean up the house, I’m ready to drop! And I rarely qualify for any of the surveys they have. I’m not against Swagbucks. It’s great for the people who have the time to devote to it. It’s just not super workable for me in this phase of life. But I do the daily polls and NOSOs and I have a code catcher I subscribe to that lets me know when new codes are available. Maybe once I’m able to stay home, I’ll have more time for it. I used to have luck with the SwagBucks TV app, but recent updates have caused it to not work on my phone as well. The app crashed a lot. I uninstalled it. If anyone knows if they fixed that, I may reinstall it. That part at least seemed to work well for me once. Thanks for all the info! I have little ones that keep me plenty busy and homeschooling too … I think that’s why I haven’t invested as much time as I want into Swagbucks & Bing Rewards. I hear many success stories though, so perhaps it may be worth looking into more. Yes, that’s exactly the kind of excitement I feel when I find giftcards in my wallet! And just at the right time too! Thanks, Jennifer! I’ve never heard of Clynk. I’ll have to look into that and see if my store has something like that. It sounds like a great idea, since we already recycle. I used reward points from an old Disney credit card and get Disney toys. I do Coke Rewards and get gift cards. I use my CVS extra bucks to get items for free. I save gift cards from other people to use for gifts. It all adds up. One reward or gift card may not seem much, but when you put it all together, it really does add up. When we went through this one year, we took some books to the used book store and received credit. We were able to buy some wonderful books for everyone on our list with the book credit we received. I love this idea of trading in used books! I know other places that allow you to trade in so many other things too, like DVDs, cell phones, etc. I use my coke rewards and get a ton of gift cards when they do their Christmas specials. Plus, I don’t even have to buy the coke products to get the points. Inhale several coworkers that drink coke, so they give me their caps! Didn’t know that about Coke rewards. I just signed up for an account and have not fully explored all their benefits. Thanks for the tip! I try to keep costs down by making almost all of our gifts. There are those for whom it is difficult to figure out what to make (i.e., my brother-in-laws) but with the help of a little creative thinking and Pinterest, I can usually figure out a few things to make that would make good gifts for family and friends. Getting supplies to make things can add up, but repurposing and refreshing what we already have, or what we can find at Goodwill is a great idea for saving money on homemade gifts. Frames, jars, vases, fabric, baskets, etc can all be found at Goodwill and be given new life with a can of spray paint or a little etching, or a simple sewn project. The dollar store is also a good place to get supplies that can used to make gifts on the cheap. All great ideas, Lisa! You’re right … with all that’s available on Pinterest and different blogs, there is certainly no lack in ideas for homemade gifts, whatever your skill level may be. Through out the year as I declutter our home and things, I save items that have not been used (or so rarely used that they are still brand new) and re-gift them. I have been able to give really nice gifts this way! Yeah, sometimes it’s better to find a home for some of your things where they will be put to better use. Also homemade gifts can be made for very little to no money. – This Christmas, hubby made our nephew a wooden airplane out of scrap wood we had in the garage. Re-gifting or passing down heirloom or other special items. – For example, when my daughter gets a bit older I plan to give her the jewelry box I had when I was a little girl. Those are the most treasured and memorable gifts! So sweet that your husband knitted you a scarf! Great post! And some really good ideas. Like you and others mentioned, I take advantage of a lot of rewards. The Shop Your Way Rewards available at Sears/Kmart have been especially lucrative as they keep giving me $5 for free with no minimum purchase, combined with sales we have been getting things for pennies or free. I use the CVS rewards too. With Hallmark and Disney items in stores it makes for some nice gifts. I also have been saving up Disney movie rewards points. I get them from my used Disney DVDs, or gifted, or traded for coupons we don’t need. At writing I have $55 in rewards. I also love cashback apps like Ebates, and all the grocery ones like Ibotta, Saving Star, Checkout 51 and so many others. If I funnel them all to gifts it adds up quickly. I consign some of my daughters things, and consider that “free” money. I get used items there, or sometimes walk away with cash for other things. Every year we participate in a household goods swap. This year I participated in two – the regular one and one just for toys. Between the two we got two puzzles, a Minnie Mouse, a Safari Ltd. Tiger, dress up clothes, a cake plate, and fridge phonics. All for free!! I do have some unused gift cards lying around that I really need to do something with. I know some Coinstar machines offer a giftcard swap, and I should investigate that. So many great ideas! Thanks for sharing! There are so many ways out there to be able to stretch our dollar! I heard that Walmart gives cash for gift cards. something to check into. I used Swagbucks to purchase items on Amazon. I dug up some herbs from the garden that had grown from seed, and gave those as gifts to someone. I like the idea of giving gifts from your garden. There are some (like me) who don’t have a green thumb and would love to receive something like that. This year we have had to get creative with gift giving. One thing I am doing is making some homemade craft gifts. I do plastic canvas and I make initials that are about 8×10. I am making a set of these in blue camo and pink camo yarn and framing them for my grandson’s mother. (she has our grandson and a little girl) These will be to hang up in the kids’ room. I have also made mailbox Christmas ornaments to give to others., We often recycle gifts and use Swagbucks gift cards. I think homemade gifts are the best! They are unique and made with love! Katy from The Nonconsumer Advocate is also doing and blogging about her 0 spend holiday. I think reading these posts and comments give us all good ideas as we move forward through the holiday season. Thanks for this! I’ll check it out! I try to repurpose some things around the house, I have extra fabric and some rice, I throw together rice bags you can warm in the microwave! I have requests for these years after I have given them as gifts. The elderly really love them, but hey so does my college student! We have made bread mixes for bread machines as presents for family and we have also used old discarded yarn or even thrift store yarn to make crocheted or knitted items for others, scarves and cold weather gear. My husband just got a homemade rice bag from his co-worker! It came in handy when he was feeling sick and achy. It’s such a useful gift! Silly though it may be, grocery store coupons helped me out one year. We had a Fry’s (Kroger store… Smith’s, Fred Meyer, City Market, King Soopers, etc.) and they sent out some loyalty coupons for $10 off a $50 purchase. Our grocery budget at the time was $40 so that gave me a whole $10 free… and even though that normally would have gone towards stock-up pantry items, that was a big saving grace for filling up my husband’s stocking. I got him a magazine, his favorite candy bar, and a few other miscellaneous items. I also second the rewards programs though. My favorites are KMart + Sears since they’re combined now. I wanted to list a few of my favorites but all of the sudden I’m drawing a blank aside from those two! Anyone else have any good rewards programs to recommend? I do the drugstore rewards and the office store rewards, which is helpful for me with school supplies since I homeschool. I like stores, like Target, which offer giftcards for rewards because there’s no expiration on them. I like making things. One year I crocheted fruits, veggies and a market basket for my daughter, she was about 2. I made two extra sets, one for my friend’s daughter and one for my niece. I have made a skirt out of a felted sweater, doll blankets, etc. Of course, craft materials can be pricey but I scour for them secondhand and use those weekly 50% off coupons when I can. Gifts from the kitchen are also nice if you have some room in your budget to make candy, cookies or fudge. Things I have done in past is took old gold jewelry and turned into cash at a pawn or antique store. Bought one of my sons a Lands End winter coat the year I did that. Also, I take all our loose change to credit union and either deposit or cash for dollar bills. No fee for members. Over summer, I took some old sports lacrosse/baseball equipment to Play It Again sports. But they don’t give you as much as I was hoping for. Great ideas! The loose change adds up. We have a big jar that we’re trying to fill up. I have used our coin jar as a vacation fund over the years. It usually meant small trips like a trip to the local fair but even those kind of trips are nice memories. I need to find a few of those gift cards;0) We have done the drug store games in order to fill stockings this year. We also have done a lot of homemade gifts as well as traded labor for gifts. Last year I worked the Scholastic Book Fair and let my daughter go on a spending spree for books! She loved it (although she got to shop before Christmas). We also play Dirty Santa with my family in order to save! Lol! Sounds a little ‘iffy’, right? Haha! Ok, got it! I’ve played this before but just didn’t know there was a name for it. In fact, we’re planning to attend a party this week with some friends, and we’ll be playing this game, except everyone has to bring something they already own, but don’t have a use for anymore. That would be White Elephant;0) It is played the same way as Dirty Santa, the type of gift is just different. So confusing, right?! I hear there is also a Yankee Swap which is a tad different. So many choices! Have fun at your party! I have all boys so I wrote a post about the best gifts for boys. Many of our gifts over the years have been pre-owned or homemade and the boys get just as excited for them. Thanks for sharing your post! I’m heading over there to check it out! That’s pretty impressive, Ai! The only problem, for me, is that over here in Italy they don’t really do any of that stuff. 🙁 I’m not crafty either, and even if I were, craft supplies are rare and expensive. Thrift shops? I only wish they existed–oh how I wish! But there is a way, even here or other places, where all those great options don’t exist to do gifts without spending a lot. I call it Five Hand Gift-Giving. You might want to check it out here: Hope it gives someone who has no gift cards, etc. some ideas!! I signed up for Savings Catcher at Walmart. I even got one of their Bluebird American Express cards. It’s not a real credit card. It’s just a ‘cash card. It only has the money you put on to it, but Savings Catcher doubles the money if you put it onto the Bluebird card. I’ve only been using it since September maybe, but I scan the receipt every time I go to Walmart and was able get some Christmas gifts essentially for free from Walmart.com! YAY! That’s how my friend got her Thanksgiving turkey for free! I’ve heard of this. I’m bummed that Walmart isn’t very close to me. I wish other stores would have something like this! I have turned old sheets into embroidered handkerchiefs, a teepee (complete with sticks from the woods! ), and, this year, 2 flannel sheet sets from my mother are making us all matching snowman pajamas + fun pillow cases. Many other little projects have been made over the years using craft supplies on hand. Also, we give free printables in repurposed/painted frames, printable paper toys, and candy, hair accessories, chapsticks and more free with drugstore rewards. Sewing is skill I need to work on. The possibilities of gift ideas from sewing seem endless. I am so encouraged by this post. Sometimes I wonder why I spend the time with Checkout51 and Ibotta only maybe earning .50 a week, but it does add up! I am close to $20 in both accounts and it really does not take much time. I rolled our coins (the bank will give you sleeves for free) and it was almost $50. We also pay cash for about everything except gas and for this we have a dedicated credit card that gives cash back points. I save them all year and have well over $100 by the time Dec rolls around. I also was able to sign up for Pinecone surveys this year and was able to get some nice DVD’s for free. I also appreciate everyone sharing their ideas. I have picked up some new tips and energy for the new year. I know what you mean. The little things that we do throughout the year to save here and there doesn’t seem like it would make much of a difference, but when you wait till it accumulates towards something specific that you’re saving for, like Christmas gifts, it makes a huge difference. I have been able to buy a lot of presents this year at Kmart because of their Shop Your Way rewards program! They’ve been giving a ton of points away for free–up to $20! This allowed me to buy gifts for two people for the handicapped development center for $0! (well, I did buy one book and one movie really cheap)… I also take advantage of other stores like Bath and Body Works, JCP, Kohls who often will send coupons in the mail for $10 off a $10 purchase or a free product! I can’t say I spend $0 on everything, but I certainly can bring the cost down greatly with those things! Awesome! There are so many stores that offer rewards … sometimes you just have to ask. I have done really well getting gift cards on the cheap this year. I got $20 in Starbucks gift cards for free through rewards programs (Coke Rewards, Disney Rewards, Pampers, etc.). On Small Business Saturday, AmEx gave statement credits of $10 up to 3 times for shopping at a small business. I bought 3 $10 gift cards – they ended up being free! I bought a Groupon for a $10 Starbucks card for $5. Got a deal through Starbucks.com for a $20 gift card for $10. Bought Target gift cards on Black Friday discounted 10%. Got 10 $5 Amazon gift cards through Swagbucks this year. I got several Amazon credits through Savingstar. I bought a couple of Amazon gift cards discounted through Gyft. I bought an iTunes gift card at 20% off. I participated in a promo with Dominos and got a free $5 gift card. I did a promo for Whole Foods – bought $20 gift cards, got $5 free. I won a $25 gift card to a local pizza place and I won a $25 Pottery Barn gift card at my company Xmas party. I ended up with $100s in gift cards for little out of pocket. I am gifting several to my son’s teachers, our mail carrier, the newspaper delivery person, etc. I am also gifting some to a few friends and putting some smaller ones in my husband’s and 2 son’s stockings. The rest I am using to purchase gifts. I can’t believe how much I’ve been able to save on gift cards with just a little work! Wow! I’m amazed at how many you were able to get, some are pretty significant amounts. The smaller ones are great too for stocking stuffers or small gift exchanges. It’s good to hear how others manage when their budgets are…well….non-existent. We’ve been there. I cashed in our credit card points and used my Swagbucks Amazon gift cards for the majority of our shopping one year. I always use Swagbucks to help pay, as well as Savingstar Paypal pay outs. This year that paid for a chunk of what I purchased online. So many people have found great uses for Swagbucks. Why have I been dragging my feet on this? I keep thinking it will take too much time that I don’t have. I went purse-digging the other day and found a good amount of gift cards! They will definitely help! Thanks for the comment, Rachael! I decided that for Christmas this year, I was going to sell everything in my house that I did not want or need anymore. I started back in October. I ended up making almost $300. Everything in my house has been reorganized from dresser drawers to the kitchen cabinets to the kids rooms. (I gave the kids the money from their toys that sold and they used that to buy Christmas gifts – I was so thrilled with their generosity! They not only bought presents for their immediate family, but they bought presents for all their grandparents, aunts, uncles and cousins, too, of their own volition.) Knowing that my husband is getting re-stationed and we have to move in June, this was a double win for me. Wow! $300! That’s great! That’s a great way to declutter and make some money as well. Wow! That’s amazing. Honestly, I’m a bad bargain shopper. I always wait until the last minute. I’m going to have to keep these tips in mind for next year. The tips in the post and all the great comments from people will, not only help during the holiday shopping, but also when you want to save up for something, like a vacation. This post came at a great time! While I’ll be ok with my Christmas budget this year, I know next year will be a struggle. I’m going back to school in January to change careers. As a full-time student, I’ll be dropping my higher-paying job, but keeping my part-time (i.e. min. wage) job. So, I’m starting to plan for next year’s Christmas budget already. I already use My Coke Rewards, CVS, Disney Movie Rewards and Swagbucks. I also use Ebates and Checkout 51 (usually only for bananas though!). I earn points with my Amazon card all year, taking advantage of some of the subscribe and save items (t.p. and paper towels). I need to turn in my empty printer ink cartridges for credit at Staples too. There is not a Kmart close to me, and unfortunately they do not do bottle deposits in Florida to take advantage of those ideas. I am very crafty though, and Pinterest has become an addiction for me! I just have to plan ahead for making gifts. I think I’ll do okay for next year, but I am going to keep a close eye on them to make sure I save them all up for Christmas and not little splurges throughout the year. I have some items I could list on ebay too, just need to get cleaning and sorting. Good luck to everyone and thanks for sharing your experiences! Sounds like you’re well-prepared for next year! It’s never too early to start saving up! I really benefited from everyone’s suggestions too! Thanks for sharing yours! I also find the coupons from harbor freight a good use they often have flashlights, and measuring tapes( 25ft) for free in their flier. Both girls and boys both love to get them in their stockings and how else are they going to read at night in bed. I used money from Ibotta, Checkout 51, and Fetch apps. I also used points from Mypoints.com to get giftcards. I ordered what I could online through Mypoints so I could collect more points. Finally, I did some seasonal work scoring standardized tests responses for Pearson online. Since I can only do a 4 hour evening shift, I wasn’t scheduled for many shifts, but I made a little over $200.